“The future never stays the same as it is in the present”. Today we grapple with more uncertainty than ever before. For many of us this is the time of year when planning out the future becomes more ‘top of mind’. These are moments where we have to stop chasing the daily numbers, pushing the immediate projects that are in the pipeline and turn our attention to laying out our future plans. Sadly we often make a poor ‘stab’ at this thinking through process; we don’t get our thinking into the right mental frames. 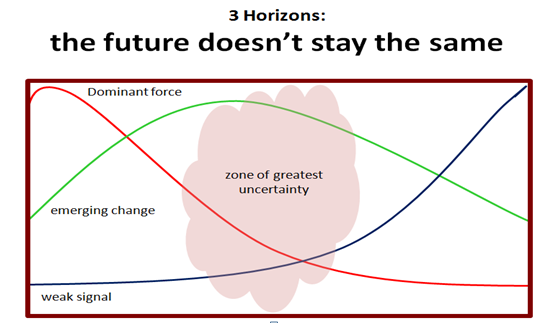 The problem for management is anything discussing the future enters the ‘zone of uncertainty’ and this ability to often ‘read the tea leaves’ can very much determine the future health and direction of the organization. Ignore these shifts or signals and you are on the path to your own ‘destruction’. Not only should we search for possibilities that extend and strengthen our existing core offerings but we should search out on a wider basis. Often we make a complete mess of this planning out of our future.